Summary: The spellbinding story of one of the most celebrated kidnapping cases in American history and a haunting family mystery that took almost a century to solve. In 1912, four-year-old Bobby Dunbar, the son of an upper-middle-class Louisiana family, went missing in the swamps. After an eight-month search that electrified the country, the boy was found in the pinewoods of southern Mississippi. A wandering piano tuner was arrested and charged with the boy’s kidnapping—a crime punishable by death at the time. But when a destitute single mother came forward from North Carolina to claim the boy as her son, not Bobby Dunbar, the case became a high-pitched battle over custody—and identity—that divided the South. Amid an ever-thickening tangle of suspicion and doubt, two mothers and a father struggled to assert their rightful parenthood over the child. For two years, lawyers dissected and newspapers sensationalized every aspect of the story. Psychiatrists, physicians, criminologists, and private detectives debated the piano tuner’s guilt and the boy’s identity. And all the while the boy himself remained peculiarly guarded on the question of who he was. It took nearly a century, the detective work of Bobby Dunbar’s granddaughter Margaret Dunbar Cutright, and the science of DNA to discover the truth. 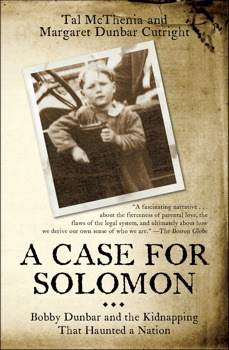 A CASE FOR SOLOMON: BOBBY DUNBAR AND THE KIDNAPPING THAT HAUNTED A NATION by Tal McThenia and Margaret Dunbar Cutright. He said the story was fascinating and goes to prove that real life is stranger than fiction! In August of 1912, four year old Bobby Dunbar, son of Percy and Lessie Dunbar, a well-to-do Louisiana family, disappeared from a family outing at Swayze Lake in Louisiana. After an eight month search, a wandering piano tuner, William Walters, was found in the company of a young boy in Mississippi and was accused of kidnapping Bobby. The story that developed is one of the most sensational and strange kidnapping cases in United States history. What made the story so fascinating was that Julia Anderson, an impoverished woman from North Carolina, came forward with a claim that the boy found with Walters was not Bobby but her son, Bruce. After a sensational trial in 1914 that drew national attention, Walters was found guilty of kidnapping Bobby Dunbar and sentenced to life in prison. Following the trial, Percy and Lessie Dunbar took the child home believing that their charge of kidnapping had been vindicated and Julia Anderson went home believing that her son has been taken from her. William Walters, always claiming his innocence, was released from prison after several months on a legal technicality. In 2000, Margaret Dunbar Cutright, granddaughter of Bobby Dunbar, received from her father the Dunbar family scrapbook which contained all the information the family had on the Bobby Dunbar case. Margaret soon discovered that the documents did not support the simple kidnapping story she had heard growing up and had passed on to her children and grandchildren. Margaret began a multi-year investigation to find the truth. It included in-depth research of available documents and articles and access to the Dunbar, Anderson and Walters family descendants. With the assistance of co-author Tal McThenia, she reconstructed the story in A CASE FOR SOLOMON – BOBBY DUNBAR AND THE KIDNAPPING THAT HAUNTED A NATION. This story that gripped a nation is far from simple and is not only about the kidnapping of a small child but offers a view of life in the South in the early twentieth century when most people still traveled by horse and buggy. The book reveals a society of lynchings and street duels as well as black versus white and rich versus poor prejudices. It exposes the yellow journalism exhibited by the three competing newspapers in New Orleans that swayed public opinion regarding the trial. The novel gives the reader an insight into Louisiana law and politics as practiced in the early 1900s. The book tells of a bitter rivalry that developed between the two competing states of Louisiana and Mississippi over the kidnapping issue. The authors also give the reader an insight into the personal lives of the main characters and the tragedies that unfolded during their lives. About 90 per cent of the 386 page book focuses on the time period from the 1912 disappearance of Bobby Dunbar through the trial in 1914. The last 39 pages speedily cover the next 90+ years of the Walters, Dunbar and Anderson families ending with a 2004 paternity test of the sons of Bobby and Alonzo Dunbar (the biological son of Lessie and Percy Dunbar) that definitely identified Bobby as the son of Julie Anderson. Several things stood out to me in this book. First, I was fascinated that something like this could really happen. Truth is definitely stranger than fiction. Second, it was hard to believe Julia Anderson showed such hesitancy in identifying her son after not seeing him for one year. Third, Eye witness testimony is always questionable. Each side had a long list of witnesses that were convinced they knew who the child belonged to. Additionally, some witnesses were obviously lying. Finally, growing up as Bobby Dunbar must have been extremely difficult. Each time a child kidnapping occurred in the United States his own kidnapping was revisited by all the media, reminding him of his own ordeal. A CASE FOR SOLOMON is a well researched and well written fascinating history thriller about a case of mistaken identity that was only resolved a century after it occurred. I highly recommend this book. Thanks to Booking Pap Pap for his review and to the publisher for providing a copy of this book. This does sound pretty amazing, although I think I would prefer to read a People-Mag size version instead of almost 400 pages! This sounds fascinating and right up my alley! I'll have to pull my copy of the book out and try to read it soon! Wow -- I think I'll find the This American Life episode -- fascinating. Sounds like a very interesting book to read. I'll have to keep this on my list of books to be read.